Someone I care about very much is currently 5000 miles away in Budapest. The city looks beautiful and the opportunity is great, but it doesn't stop me from wishing we could see each other. So how do I bring my own little bit of Hungary to the United States? Through baking, of course. I can't get over how weird egg yolks are. I really don't know a whole lot about Hungarian food. Words that come to mind are paprika and goulash (so much fun to say, try it) but my knowledge in the baked goods department is lacking. Except for dobos torte, sigh. I'm severely lacking in the space and resources for that. I'll save it for another time. See? This is what I'm working with. 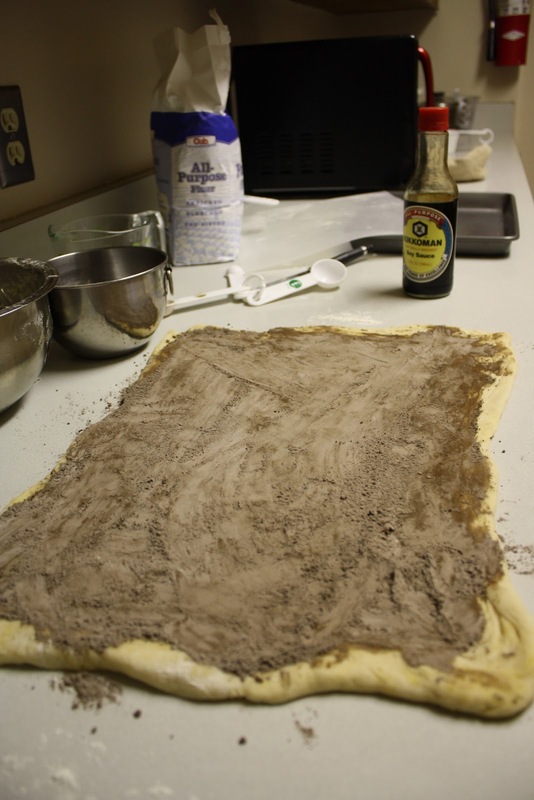 I used that bottle of soy sauce as a rolling pin, haha. I finally found something called Kakaós Csigák, which I have nooooo idea how to pronounce, but I've seen it translated as chocolate snails, so that's what it will be. In my book, this is the first successful yeast bread I've made at school, without the help of my stand mixer. I don't really count the ugly bread, even though it was tasty. This gives me confidence! Confidence is key! Mmm. To my Hungarian friends out there...miss you. Come back soon! Pour flour, salt and sugar in a large bowl, make a well in the middle and cut butter around it. Sprinkle into the well, add a pinch of sugar and enough milk to cover the yeast. Stir a few times, then cover it with a dish towel and let the sponge rise for about 15 minutes. Add remaining milk and the egg yolk, then knead the dough for a few minutes until it comes together (if it is a bit sticky, you may want to use a bit less milk first, then add by the tablespoon). Cover the dough again and let it rise until the volume is doubled – this took about an hour. in the meantime mix icing sugar and cocoa for the filling. Preheat the oven to 350F. When doubled, knead the dough a few times then roll out into a large rectangle. Cover evenly with filling and roll it up, starting with a long edge. I kept dabbing the edge with water to keep it together. 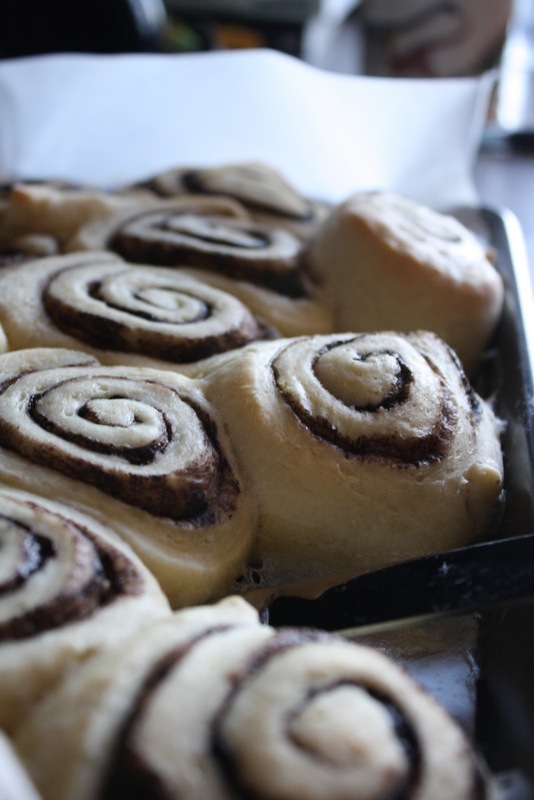 Cut into slices and transfer onto a parchment lined baking sheet. Bake for 15 minutes. Meanwhile, heat the extra 150ml milk and melt the butter in it. pour the mixture over the rolls and bake for another 15 minutes. until puffy and slightly golden. This one does look tasty. It would almost have to be judging by the name of the cookbook. I like the mix of bread with chocolate, if it is done right. Judging by the pictures these are spot on. Well done-yum! Haha, Chocolate River just reminds me of that terrible scene in Charlie and the Chocolate Factory! These look great.... I used to use a nalgene water bottle to roll things out lol! My husband is part Hungarian and he spent some time in Budapest, I however was not with him. I did look up a bunch of recipes trying to replicate a Hungarian cookie his father loves. I feel your sentiments on baking if you can't join them.